Rendered my first ever batch of leaf lard, and baked 2 loaves of white bread with it........I will never use butter or store bought lard again.....cant wait to use it in a pie crust. Such a simple thing to do, a little hard to find mind you, but well worth the foot work. If you're interested in making your own lard, here is how I did it! 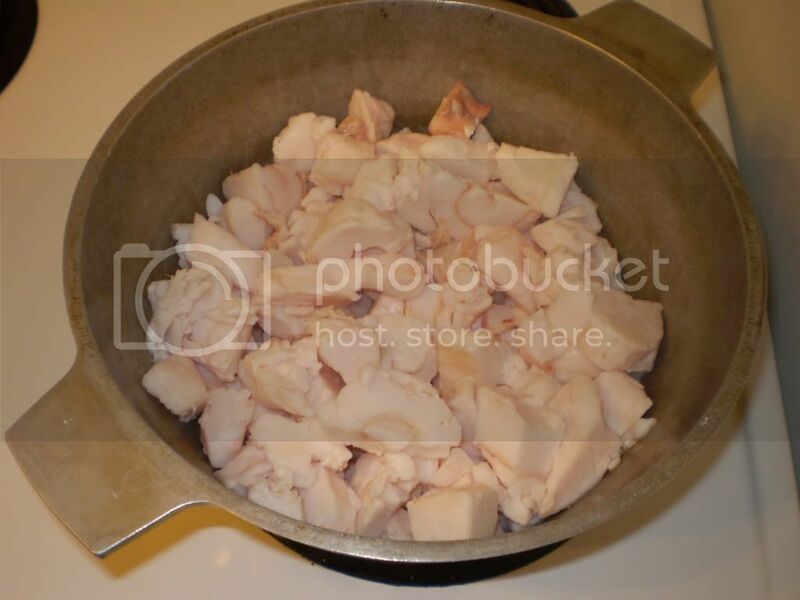 heat dutch oven or pot over medium low heat, add 1/2 cup of water (this prevents lard from burning and will evaporate as the lard renders).Cut the leaf into 1/2 inch cubes. Simmer until you start to hear popping sounds, which is normal, it's just the water leaving the meat bits in the lard. I removed mine immediately and strained it thru a cheese cloth. The left over bits of browned meat are a really good treat, so do not throw them away, I used my left over bits to make a traditional potted French Canadian meat called Cretons (if you'd like the recipe i'd be happy to share it with you). The entire rendering process took roughly an hour and I stored mine in Zip lock tuperware containers when it cooled slightly, this lard needs to be stored in the refrigerator or frozen. now those sound good!! do tell! There're lots of different recipes for confit of potato, some uses butter, others duck fat or lard. I usually use duck fat, but lard one is great, too. This may sound as a dumb question, but I never heard of leaf lard. Is this the same as "fat back"? I don't know where the term fat back came from. It seems like there are various grades of lard, leaf lard being the highest grade (the best lard). If also has a higher rendering/melting point (43–48 °C (109–118 °F)). Fatback is 30–40 °C (86–104 °F). the leaf comes from the fat surrounding the pigs kidneys and near the loin area. In my search for the lard, it seems to be found only in a butcher shop that butchers the animals on site. I found it at The Healthy Butcher in Toronto, Ontario. I tried leaf lard in pie crusts for a short while -- and I make a good pie :) -- and didn't like it, at least for dessert pies. It brought a flavor to my palate that just didn't mix well with sweets. That's just me, of course, and YMMV. It might be much better in savory pies, which for some reason I never tried. And I found that even in the freezer, in an airtight metal container, it went bad very quickly. Like in a couple months. Leaf lard in bread sounds like a better match to me. I'll have to try that. If others want to try it without rendering it, Mexican groceries are a good source. It's a staple of Mexican cooking, as I understand it. Not all carry it, but some do. Some butcher shops sell it as well. ...that it imparts no distinctive flavour or that it's as neutral in flavour as shortening? I suppose maybe the lack of butter (or other flavoured fat) could have contributed to what you experienced. My mom told me that in days gone by, frequently, the neighborhood women would get together and render lard. I'm not sure how they managed to preserve it. I am guessing that they got the pig fat from neighborhood butchers (my uncle was one of them) and rendered away! They used it in just about everything - Grandma lived to the ripe old age of 102 and her sister to 107! My mother is from rural Quebec and they used Leaf Lard in a wide variety of French Canadian dishes, I recently used it to make Cretons, a kind of a pate, similar to a liver pate. In the bowl of your mixer, mix together the warm water, agave nectar, sugar and yeast, proof for 5 minutes or until foamy. Add the salt and leaf lard and blend. Switch to the dough hook and blend the flour in 1 cup at a time, you may need to turn the dough out onto your work surface to incorporate the final cups of dough. Knead dough until smooth, roughly 10 minutes. Grease a bowl with the lard and place the dough into the bowl, cover with plastic wrap and allow to proof for an hour or until it has doubled at room temperature. When dough has doubled, turn it out onto a lightly floured work surface and deflate. Knead it for a few minutes. Divide into 2 equal portions and shape each portion into loaves. Grease 2 9"x5" loaf pans with a small amount of the lard.Place into pans, cover lightly with plastic wrap and allow to double in size or until the dough has risen an inch or so above the top of the pans. Preheat oven to 350 degrees fahrenheit. Remove plastic from dough and place loaves into oven with rack in the middle position, mist the inside of the oven with water and bake for 30 minutes or until loaves sound hollow when they are tapped, turning the loaves half way through. Remove from loaf pans and cool on a rack. Saindeux is commonly available in France and from what I remember was made from rendered pork fat. It's used in a lot of pastry and cookie recipes. It's use is in line with its common use in English recipes.